Finally, office furniture that works just as hard as you do! aspenhome’s traditional Arcadia credenza and hutch in a versatile wire brushed truffle finish showcase an excess of modern features. The top of the hutch flaunts a center adjustable shelf flanked by two cabinets with adjustable shelves and interchangeable glass or wooden fronts for display or storage. Two pullout tablet trays allow for handsfree viewing on either side, while LED touch lighting and a built-in power strip add extra convenience. 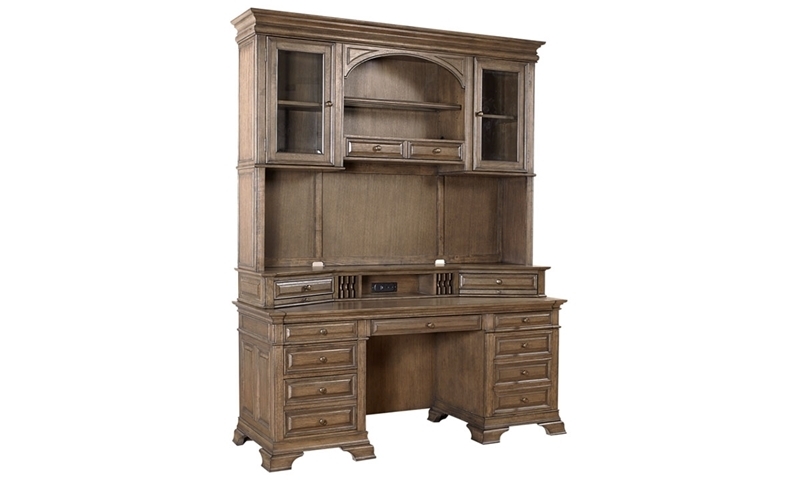 The 73-inch desk offers a plethora of organizational options with a removeable drop-front keyboard drawer, 3 utility drawers, a locking file drawer and cabinet with a pullout surface for easy printer access.